Fatty liver disease is a condition marked by fat accumulation in the liver that can occur in drinkers and nondrinkers alike. While some liver fat is common, too much fat in the liver can cause inflammation and scarring that eventually progresses to total liver failure. Anemia, a deficiency of red blood cells, often accompanies fatty liver disease. Your liver works as a sort of filter for your blood, cleansing it of impurities and extracting nutrients and other substances like medications for processing. At any given time, your liver holds about one pint, or about 13 percent of your total blood supply, according to the Ohio State University Medical Center. Blood flows into your liver via the hepatic artery from the stomach and intestines. In your liver, nutrients and other substances are broken down so they can be more easily used by or eliminated from the body. Your liver produces bile, which breaks down fats and carries away waste products. It also stores iron and processes hemoglobin, the oxygen-carrying protein found in red blood cells. Nonalcoholic fatty liver disease is a condition in which your liver has difficulty breaking down fats, causing them to build up in your liver tissue. The exact cause of fatty liver disease is uncertain. However, obesity, high cholesterol, high triglycerides and metabolic syndrome are all risk factors. 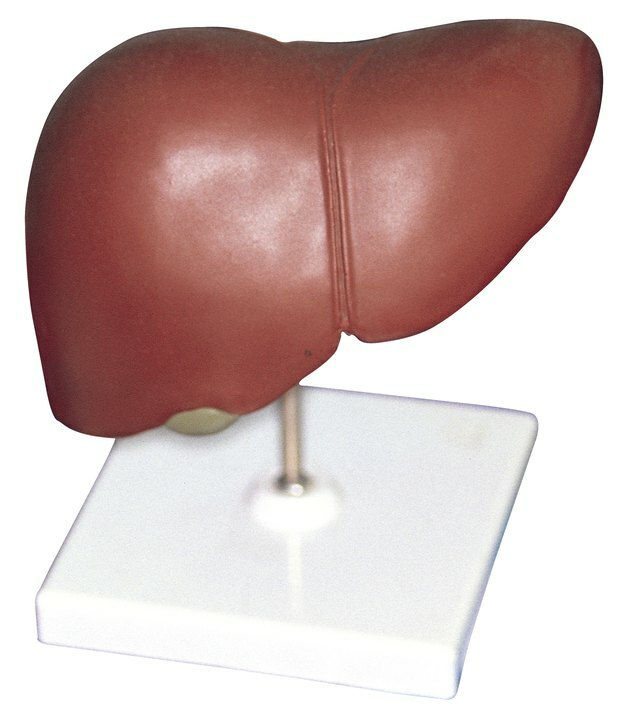 Fatty liver is common in individuals who abuse alcohol. Alcohol-induced fatty liver causes inflammation that leads to scarring, which may in time degenerate to cirrhosis, an end-stage liver disease marked by decreased liver function and eventually failure. Anemia occurs in about 75 percent of patients with chronic liver disease, according to a Spanish research report published in the October 2009 issue of the "World Journal of Gastroenterology." Anemia is a condition in which your body is deficient in red blood cells, which transport oxygen throughout the body. It is caused by either inadequate red blood cell production, bleeding that causes loss of red blood cells, or the destruction of red blood cells faster than your body can make them. In the case of liver disease, hemorrhage of blood into the gastrointestinal tract is a major cause of anemia. The first line of treatment for alcohol-induced fatty liver disease entails abstaining from alcohol consumption. Depending on the extent of liver damage, your health care provider may recommend other interventions as well. For nonalcoholic fatty liver disease, interventions include lifestyle changes like weight loss; exercise; a diet rich in natural fruits, vegetables and whole grains; increased consumption of healthy fats contained in fish, nuts and olive oil; and a reduction in saturated fat consumption.